Once again spring is here and our real estate market is getting ready to go into over drive. We have lots of buyers looking for homes. Recently in a number of my open houses in Reston VA I have received a good number of visitors at open houses even on cool days. I know seeing the number of visitors that buyers are itching to go out and see homes. What is cooking in our local market? For one thing, we are still experiencing low inventory, and competition for homes is fierce.When competition is tight, buyers are made to jump through hoops. 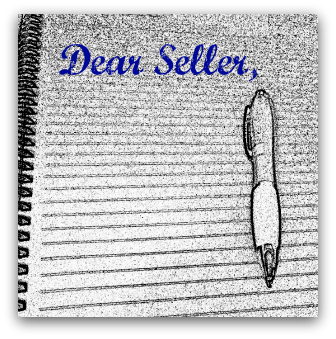 One of the things that buyers are sometimes asked to do is to write a letter to the seller. You write a letter to the seller, even including a picture of your family and that beautiful dog. I confess I was never a fan of these letters. I do however know there are circumstances where the letters work. If you decide to write a letter to the seller, my suggestion is go beyond talking about yourself and family, or how you love the neighborhood. I think its good to make a personal connection with the seller. Some sellers may love a buyer who is going to raise a family in a home that they raised a family. But I think its even better to explain to the seller how working with you will benefit them. May be mention that you will try to negotiate fairly with the seller. May be If the seller has a beautiful garden, then bring up your gardening skills and how you will maintain the garden after you buy the home. The point is, make it about the seller and how the seller will benefit from working with you. On the other hand sellers have to be careful not to violate Fair Housing Act. They can not discriminate against a buyer for any reason other than financial ability to purchase.